First match of the season, against the Division One Champions who are extremely drained of superstars. There’s two ways of looking at this for Worcestershire. As a county, in a perfect world you would want all the headliners to come to New Road. That’s what draws crowds, makes memories. On the other hand, the lack of power-brokers lends itself to a much more even playing field, a realistic chance of making a real fist of it. Glass half-full or glass half-empty whichever way the philosopher in you condenses it, this is an early breakthrough for both teams to set a benchmark and prove a point. Jason Gillespie and Steve Rhodes are both battle-hardened characters and have shown they aren’t afraid to turn the manual around when it comes to cricketing decisions. Yorkshire are widely tipped to relinquish the Championship, and Gillespie will see it as an inspiration. Meanwhile, Rhodes believes what separates his side from those relegation suffering years is that they have strength in depth like never before. Gillespie has already warned the hosts that they won’t take them lightly and is quietly confident about chalking up a win. He says he already knows who’s going to play, so selection headaches won’t be a burden for him. To add to the lack of levity is Worcestershire Captain Daryl Mitchell’s remark that Yorkshire still possess the best bowling line-up in the country. It’s been all hunky-dory with no fireworks thrown in yet, those better be let go of come Sunday. Moeen Ali’s return is a welcome sight for Pears supporters, and even more considering the occasion. He will add much needed solidarity at the top where Worcestershire can be vulnerable at times. He might not roll his arm over with concerns still persisting over the injury, and New Road could seem like a much more welcome place than those Australian cauldrons. He will have lot of support cheering him on; he’s already gained hero status in these parts. Jack Brooks was a key figure in the Tykes attack which won the title last season. Colourful old school character sporting a headband, he has already picked up nine wickets this time around to go with the 68 scalps he accounted for in 2014. No doubt Brooks’ aggression will severely test the Pears’ top order. Rhodes has no injury worries and has a full squad to pick from, a luxury which he didn’t have for most parts last season. Ali will make his comeback having overcome the side strain he sustained during the World Cup. More remarkably, Sri Lankan off spinner Sachithra Senanayake is set make his debut having been in UK for only 24 hours. He had been playing in Sri Lankan domestic T20 competition on Friday and flew into Heathrow in the early hours of Saturday before joining up with his new team mates on Saturday evening. It will be interesting to see who gets the nod of Rhodes for the all rounder’s birth with Gareth Andrew and Joe Leach both fighting for it. Andrew was lethal with the new ball before he succumbed to injury but Leach was equally productive with the bat in the latter parts, at times carrying the Pears to respectable scores last season. Alex Gidman will also play his first match having departed his home club Gloucestershire during the winter. 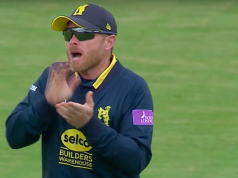 Apart from the six regulars who had England call-ups, Yorkshire’s captain Andrew Gale too is missing due to suspension to compound matters. Alex Lees will stand-in as the makeshift skipper and the recent signing Cheteshwar Pujara will make his debut to add some experience to the middle order. The champions will look to their in-form fast bowlers to get them through with assistance from the pitch expected. Yorkshire Squad: Alex Lees (captain), Jack Brooks, Tim Bresnan, Karl Carver, Matthew Fisher, Andrew Hodd (wicketkeeper), Dan Hodgson, Jack Leaning, Steve Patterson, Cheteshwar Pujara, Richard Pyrah, Will Rhodes, Ryan Sidebottom. There could be a hint of rain around on Sunday but forecast is expected to get better on Monday with lot of dry spells. Tuesday and Wednesday could see lot of sunshine with warm weather. The pitch seemed unusually green going into the match and whoever wins the toss would opt to insert the opposition in. With Yorkshire very strong in the pace department, it kind of feels like playing into their hands and Worcestershire wouldn’t want to bat first especially with a cloud cover expected on Sunday. – Of players to bowl at least 200 deliveries in the 2014 Championship, Steven Patterson bowled the highest percentage of dot balls (82.4%). – Since the start of the 2013 season, Worcestershire have won nine, drawn five and lost just two of their 16 Championship home games. – Worcestershire batsmen hit 64 sixes in the 2014 Championship, the most in Division Two. Only Somerset (66) hit more across both divisions.